Where's This Hell Gate Bridge? Where in the world is this bridge? If you answer "Sydney, Australia" you're wrong. If you guess "Newcastle, UK" or "Auckland, New Zealand" you're still wrong. But if you say "New York City" you've hit the jackpot. 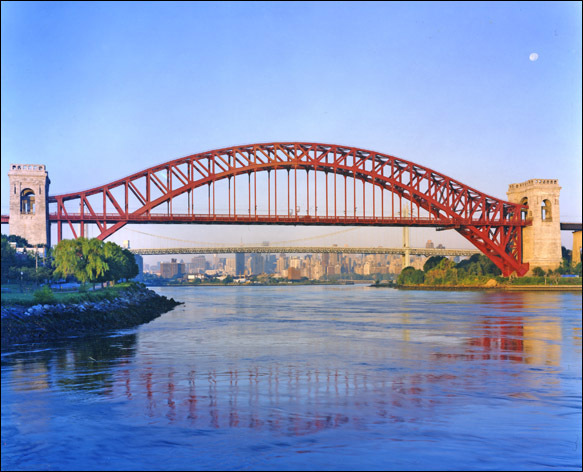 It's the Hell Gate Bridge, a 1,017-foot (310 m) steel arch carrying railroad traffic across part of the East River called Hell Gate. Its revolutionary design caused a stir when it opened officially on Sept. 30, 1916. Doomsayers at the time predicted it would collapse, but it's still in business, and will probably remain so for centuries. It inspired the construction of similar bridges around the world. The Hell Gate Bridge was designed by Gustav Lindenthal (1850-1935), a brilliant self-taught civil engineer. Born in Brno in what is now the Czech Republic, he had first worked as a mason and carpenter. At 18, he moved to Vienna, and found a job in the engineering department of a railroad company. He never attended university, but taught himself mathematics, engineering theory, metallurgy, hydraulics, estimating, management, "and everything else that a successful bridge engineer needed to know," quoting Henry Petroski's book, "Engineers of Dreams: Great Bridge Builders and the Spanning of America." Lindenthal emigrated to the US in 1874. At first, he worked as a journeyman stonemason for the memorial granite building of the Centennial International Exhibition in Philadelphia, and later was employed by the Keystone Bridge Co. on numerous projects before being recognized as a gifted bridge engineer. It's thought his early memories of a famous bridge in Cologne (Koln), Germany, inspired his design for the Hell Gate Bridge. Eminent bridge designers from other countries visited Lindenthal and marvelled at his radical ideas. One of them was Australia's Dr. JJC Bradfield, lead engineer in the New South Wales Department of Works. When he returned home to Sydney from a six-month world tour in 1922, he changed the design for a Harbor bridge from an ugly cantilever to a graceful single-arched steel structure. Sydney Harbor Bridge (aka The Coathanger), opened in 1932, is the world's largest but not longest steel arch bridge. Its total length, including approach spans, is 1,149 metres and its arch span 503 metres. Its top is 134 metres high. People had talked about building a bridge from the northern to the southern shore of the harbor since 1815, when the then colony's government architect, Francis Greenway, thought of one being needed one day. Various designs were considered and discarded for more than a century. Then in 1922 a general design was prepared by Bradfield and officers of the NSW Department of Public Works. The government called for worldwide tenders to build the bridge. The contract was let to Dorman Long and Co of Middlesbrough, UK. Construction began in 1924, took eight years and employed 1,400 men. Six million hand-driven rivets and 53,000 tonnes of steel were used. The bridge now carries eight traffic lanes and two railroad tracks. The Bridge was officially opened on March 19, 1932. Before Premier JT Lang could cut the ribbon, Captain Francis de Groot, a member of a right-wing political group called The New Guard, rode up on his horse and slashed the ribbon with his sword. He thought the Bridge should be opened by a member or representative of the Royal Family. Police arrested him, and the Premier cut the hastily repaired ribbon with a pair of gold scissors. The Tyne Bridge in Newcastle-upon-Tyne, England is a smaller version of the Sydney Harbor Bridge, with a length of 397 metres and the main span 161 metres. "There is much controversy surrounding the two bridges, and which one may have been a model for the other," says an Australian government Web site. "Although the Tyne Bridge was opened in 1928 - four years before the Harbour Bridge was opened - the tender was submitted and contract signed for the Sydney Harbour Bridge in March 1924. The designs for the Harbour Bridge were put forward by Dr. J C Bradfield before this date. The tender for the Tyne Bridge was accepted and contract signed later that year in December 1924." Actor/comedian Paul Hogan was once a rigger on the Sydney Harbor Bridge. A few weeks ago, the luxury liner Queen Mary II, the largest ship to visit Sydney, was too tall to go under the Harbour Bridge and too long to dock at the International Passenger Terminal at Circular Quay. The world's longest steel arch is the Lupu Bridge 550m. (1,804ft.) in Shanghai, China, according to a list of longest spans published by Wikipedia.